Torricelli's Theorem | THERMO Spoken Here! A sce­nario for this proof is a reservoir of water that extends a great distance to the left (Fig 1: Section View). Water is constrained by banks, one close to us, the other at a distance into the page (not shown). On its right the water is constrained by the left face of a dam. Near the base of the dam, a depth of "H" feet below the water surface, a pipe with a valve passes through. While the valve is closed, water does not flow. Upon opening the valve water flows from the reservoir through the pipe to space at the right. Obvious Question: With the valve full open, what exiting velocity would the exiting water attain. A general answer or solution of this imaginary event was first determined by Torricelli in 1644. Torricelli knew flowing water experienced friction which impeded its flow. Friction, then and now, being a complicated matter, Torricelli assumed there was no friction. Thus his equation, now callte theorem, Eqn-1 provides calculation of the maximum velocity of flow. est, that is, frictionless exit velocity of the water. Confirm Torricelli's Theorem: Torricelli's Theorem will be confirmed twice. Two distinct system models will be used. 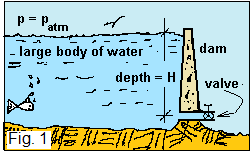 Each model assumes reservoir water depth, H to be constant. This condition is reasonable provided the reservoir is vastly large to the left or if as much water enters the reservoir from adjacent streams as leaves through the relatively small, open pipe. Either way we assume: dH(t)/dt = 0. The vertical planes, "in - in"
and "out - out," are stationary. SYSTEM I: For this approach (sketched to the right) we select the water in the reservoir (at an instant in time) bounded by two imaginary, vertical and stationary planes. One plane is notated "in - in," the other as "out - out." These planes identify entrance and exit boundaries of our open system, respectively. The other boundaries of the water, its surface, the banks and the "water-side" surface of the dam, are natural; they don't move and water does not cross them. Below we apply the mass equation and energy equation to this system. Next, Eqn-3 below left, we express min as water density times area times average velocity "in." Also we express the "out" as density times volume rate "out." Since density is constant, it is divided from the equation to obtain ~ Eqn-3 (below right). Our model tells us that the entering velocity is zero. Of course it is not zero; but it is VERY small. We have argued that the exitinf volume-flow-rate, Vout, is constant. Therefore by Eqn-3 right we have the product, AinVin,avg is also constant. The entrance area, Ain is VERY large. Consequently the entering average velocity evaluated over the entire "in - in" plane is VERY small. 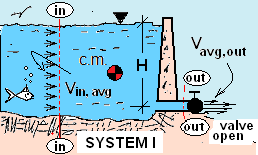 The velocity of the water entering the system, Vin,avg is not zero but negligibly small. Terms "left-of-equality" are struck out. (a) Within dU/dt, U is an integration over the system of increments of du. Internal energy is a function of temperature and specific volume: U = U(T,v). We assume the temperature and specific volume of the water does not change hence dU/dt = 0. (b) Kinetic energy and potential energy changes relate to the center of mass of the water which does not move. There are no work effects, (c), by turbine, paddle-wheel or such. However, work of flow friction is identified,(d). The friction work term is written to include that it is always negative. Thus its effect appears as an energy loss of the flow. The sum of heats (e) equals zero. To continue, since the system substance is incompresible, it is convenient to represent enthalpies of the flowing streams as: h = u + p/ρ (where ρ = 1/v. (5) We continue to carry the friction work. By Eqn-2 entering and leaving mass rates are equal so divide Eqn-5 by the mass rate. Specific internal energy of simple compressible water is a function of its temperature and specific volume, i.e., u = u(T,v). We take the entering temperature and density of water to equal that of the leaving water. Thus uin(T,v) equals uout(T,v). The entering and leaving specific internal energy flow rates of the water sum to zero. Next, we represent the specific kinetic energies explicitly noting that Vin,avg as negligible. Potential energies have the surface of water as datum. Elevation at the water surface is set to "0". The "out" terms pose no difficulty. The pressure within a sizable flowing jet equals the surrounding atmospheric pressure (pout = 1 atm). The "out" potential energy datum is negative, (-H). Elevation, designated "Z" is positive upward and equal to zero at the reservoir surface. Also, by the mass equation, we established that Vin is negligibly small. For water entering, the average velocity is easiest to prescribe. It is negligibly small: Vin,avg ~ 0. We see the other properties of the water, its pressure and elevation, will have different values upon entering depending upon the depth of entry, that is, the elevation of entry, z. As a convenience below, we apply the identity, v = 1/ρ, to have the term, p(z)/ρ appear in the energy equation. (7) Usually friction is assumed zero at the start. But we keep it to see. The plane "in"-"in" extends from the surface of the reservoir to its bottom. By our model, water enters (moving horizontally) through this plane in all of its vertical locations. So what are the values of the terms (below left) over their of entrance (below right)? energy rate into the system term. Below we build a table that lists the values of each of these terms and their sum. Elevations are notated, z*, in the left column. The second column lists the pressure-related term, the third column lists their sum - at that level of depth. their form as a solution progresses. Our energy equation has become three terms. Left of equality represents the rate of change of energy of our system. Being infinite, the energy loss of the system is not zero but the rate of energy change is zero. Right of equality the terms within the parentheses subscripted "out" are positive as is the multiplied, mass-rate. Thus the aggregate term is negative meaning there and the sign on "out" is negative... there is energy decrease of the system. And there is friction. Friction is difficult to prescribe. By the supposition of no friction, the above solves to yield Torricell's Theorem. greatest, frictionless exit velocity of the water. SYSTEM II: A second system to confirm Torricelli's Theorem is shown. This system is the reservoir again but we will not define our system left boundary by "vertical cutting plane." There will be a new "entrance geometry" and an exit plane the same as with SYSTEM I. 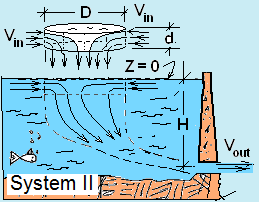 The "in" or System II is imagined to be a narrow annular area at the water surface and perpendicular to it. All of the water "in" enters the system passing through this thin, ribbon-like area which has a small dimension of depth, d and is circular with a great diameter,D. Consequences of the mass equation are the same as concluded for SYSTEM I.
frictionless exit velocity of the water. Our first conclusion is the correctness of Torricelli's Theorem. Secondly we have developed the idea "free surface," of a reservoir of water (or other fluid). Such surfaces can be uses as planes of " in" or " out" for a system.